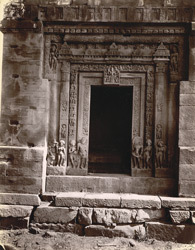 Photograph of a sculpture panel on the south face of the Dashavatara temple, Deogarh taken by Joseph David Beglar in the 1870s. Deogarh is located in the modern state of Madhya Pradesh. The Dashavatara Temple at Deogarh was built during the 6th Century and is home to some of the finest examples of art from the Gupta period found anywhere in India. The temple is in a ruinous condition, however the wall panels adorned with depictions of different myths related to Vishnu are well preserved. The whole structure is raised on a platform which is ornamented with scenes from the Ramayana and other stories from the life of Krishna. The temple has a beautifully carved doorway flanked by guardian figures with attendants beneath, river goddesses in the upper corners, amorous couples along the jambs and an image of Vishnu seated on a serpent mounted on the lintel.